For a while now I've pondered why professional athletes host parties at nightclubs. Living in Charlotte, we see it a lot whether it be players from the Carolina Panthers and Charlotte Bobcats, or players from teams visiting them. My position has always been that sure, a promoter is paying you somewhere between $5,000 and $10,000 to allow him to put your name and face on a flyer (some also do drops for radio ads) and for you to show up at his nightclub for about two hours, but it's not worth it. First of all, five- or ten-grand pales in comparison to the tens of millions you make on the court or field. And secondly, do you really want to have your name attached to a scene where people can get drunk and crazy and you not know what could happen? Michael Vick is currently learning that the hard way, which seems to be how he prefers to learn things. While it appears that he's being cleared of any wrongdoing for the shooting that took place at a birthday party he held in Virginia Beach two weeks ago, the event should've never happened to begin with. Vick is scheduled to make $5.2 million this season as a backup quarterback for the Philadelphia Eagles, but he wants to make a little extra change by having a birthday party in which the general public could pay to attend? But it's not about the money for Vick and others like him. They do it for the allure of the spotlight. They do it to be reminded that people will pay money to come see them. They do it so people can tell them how great they are. Well, uh, that's what your football games are for. 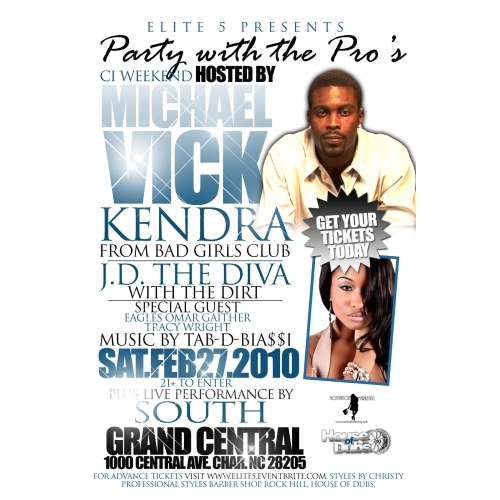 Michael Vick's party in Charlotte in February. Vick hosted two parties in Charlotte earlier this year during CIAA Week. And he's been making his rounds at popular nightclubs in cities around the country since football season ended. But since he's not smart enough to curtail his activities, his probation officer is doing it for him. In lieu of his recent incident, Vick must now get permission before leaving the state and must get his travel plans approved. This new stipulation caused him to miss two scheduled appearances over the weekend: a football camp in Baltimore and a golf tournament in Atlanta. Ironically, those are the kinds of events a pro athlete should be attending. So while Vick sits home, he can get mentally prepared for football season. And many professional athletes watching should learn from his mistakes. 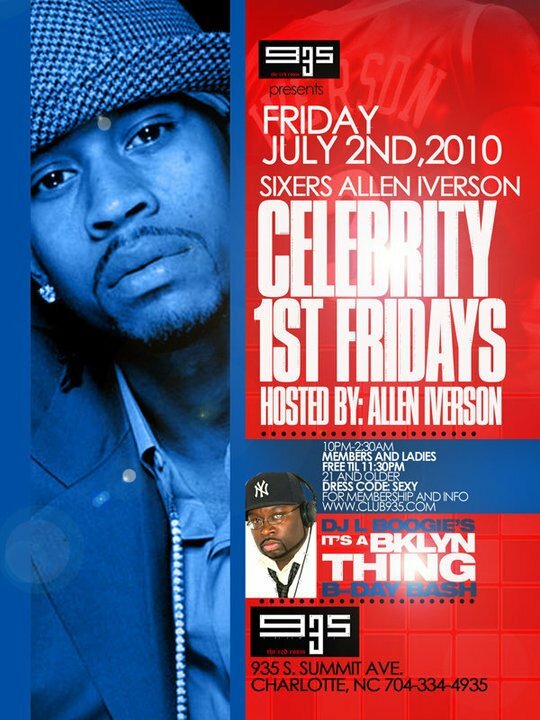 Allen Iverson's party in Charlotte during Fourth of July Weekend. 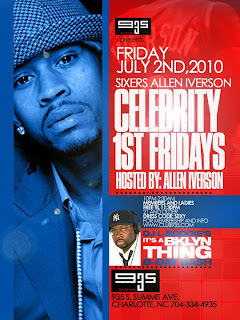 First up, Allen Iverson. This dude is in the clubs more than Grey Goose. He hosts parties in Charlotte at least twice a year, and during Fourth of July weekend he hosted a party here at Club 935 on that Friday and at Raleigh Live, a nightclub in Raleigh, that Saturday. A few months ago, he stirred up the gossip sites and rumor mills as he was criticized for hosting a CIAA party here in February, the same time in which he was supposedly on leave from the 76ers so he could spend time with his sick daughter. According to a Twitter post from Iverson last week, "now that my family is healthy and rock solid, I can concentrate fully on doing what I do best!" By that, for the record, he means succeeding on the basketball court and in life. He could do himself a favor and say good-bye to nightlife. But what we've seen in Charlotte is nothing compared to what's about to take place in Miami. The second most talked about thing regarding Miami Thrice--Lebron James and Chris Bosh joining forces with Dwyane Wade on the Heat--after how great the team will be is how much greater the party scene is going to be in South Beach (if that is at all possible). Reports have surfaced all weekend about parties taking place to celebrate Miami's dynasty-in-the-making. If those guys are as committed to winning championships as they claim, then we won't be seeing paparazzi photos popping up all summer of them coming out of nightclubs. 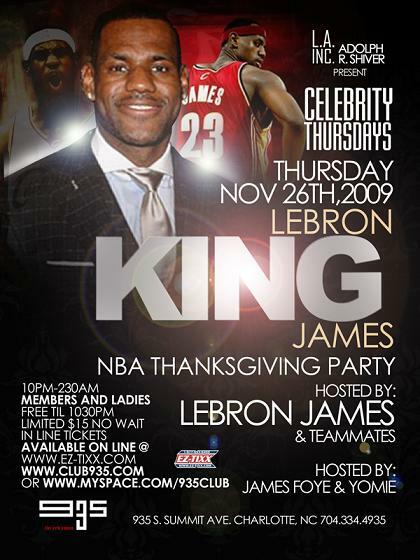 LeBron James' party in Charlotte last November. We probably couldn't fault James if he wanted to make up for the partying time he lost by living in Cleveland--which is probably why he would usually party when he came here ("King James and Shaq Party in the Carolinas"). But the world is watching him now, even more so than before, and unless he wins on the court people in Miami and everywhere else will deem him a failure (albeit a rich one). He says he's coming to Miami to "be about business" and by that he means on the court. We shall see. If I was one of the Carolina Panthers, I'd take it easy on the nightclub scene right now, considering you guys didn't make the playoffs last season and have since lost key players. If I was one of the Bobcats, I'd chill out too. You're coming off your best season, but your conference has gotten better this summer while you haven't done anything in the draft or fee agency. To be clear, I'm not against athletes partying. Heck, when you're in the mood for going out, reserve the entire VIP at Butter NC, Suite, or Club 935, buy out the bar, and party your arse off. Just don't make it your party and don't let the club owners advertise that you're going to be there. Basically, don't draw attention to yourselves--you get enough of it already. Plus, more importantly, if something goes wrong at a party that has your name on the bill, you're going to be held responsible or will at least be subjected to unnecessary speculation and investigation until the facts of the incident are made clear. Which is exactly what Vick is currently going through. And one quick side note, which I literally just remembered as I was ending this blog post, and coincidentally makes another valid point for my argument, but I'll let you figure out what the correlation is. True story, I saw Sean May at Kazba Friday night and dude looked slimmer than he's ever been.